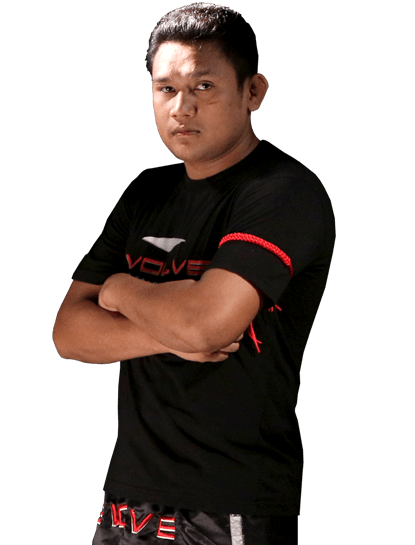 Nonthachai is an Instructor at Evolve Mixed Martial Arts in Singapore. He is a 3x Lumpinee Muay Thai World Champion, 1x Rajdamnern World Champion, and a Thailand Champion. As one of the top World Champions in Thailand, Nonthachai has the distinction of fighting and beating many Muay Thai legends. In his elite career, he has won 7 championship title belts at the highest levels of Muay Thai in Thailand. The Thai media has labeled him as one of the most dominant fighters in Muay Thai due to his aggressive style. Nonthachai is a certified Muay Thai instructor from the Sit O Camp in Thailand. Nonthachai is originally from Thailand. Nonthachai’s fighter name means “Great Luck to Win” in English. Nonthachai started training Muay Thai at 9 years old. Nonthachai has competed around the world including Finland, Italy, France, and Holland. According to the Evolve Muay Thai instructors, Nonthachai is one of the best football players on the team. Nonthachai names his toughest opponents as fellow Evolve instructors Namsaknoi and Orono.